For that special Hot Sauce Chili Head, give the gift that keeps on Burnin! 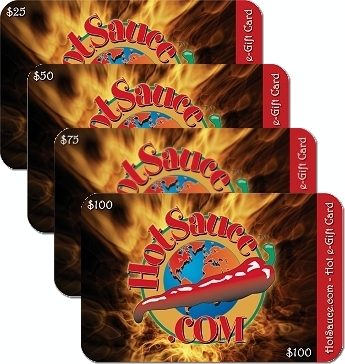 HotSauce.com e-Gift Cards are the perfect Hot Sauce Gift, regardless of the occasion. Choose any amount from $5 to $5000, redeemable toward thousands of hot sauce and fiery foods products. HotSauce.com e-Gift Cards never expire and they are delivered fast and free to the lucky recipient. All e-Gift Cards are activated and emailed to your recipients email address specified in the e-Gift Card order screen within 24 hours and may be applied immediately to your recipients future hot sauce order. Your recipient will simply shop, select their item(s) and enter their personal e-Gift Card Code during checkout. All e-Gift Cards may be reused until the funds are exhausted, and your recipient may check their e-Gift Card available balance at any time using our secure customer management system. Your e-Gift Card recipients also have the option to pay any additional amount due should their order total more than the Gift Card's value. e-Gift Cards may be used to purchase any HotSauce.com products, with the only exception being other e-Gift Cards and are not redeemable for cash. No shipping, tax or handling fees apply to the purchase of this item! HotSauce.com e-Gift Cards may be purchased using a Credit Card, PayPal or Google Checkout. SPECIAL e-GIFT CARD BONUS OFFER! For a limited time, when you buy a Hotsauce.com e-Gift Card worth $100 or more, we will add an additional 5% to your e-Gift Card value - *Absolutely FREE! *To qualify for the additional 5% added value, e-Gift Cards must be purchased for a value of $100 or more, in increments of $100. When you make your purchase on HotSauce.com, the shopping cart will show the original value of your e-Gift Card. At order completion and capture of your funds, the code associated with your e-Gift Card will be updated and we will add the additional 5% to the cards value. If you have any questions about the Bonus e-Gift Card Special, please call us toll free at (877) WWW-SAUCE. Give the gift that keeps on Burnin'! Send your favorite Chili Head a HotSauce.com E-Gift Card today!